I finally found a — well, I won’t say perfect, but suitable — town with my main goals in rebuilding fulfilled last night. It took many resets, but could have been worse, and I think the time spent was worth it, especially considering how long you can play this game! I only explored a town if I was intrigued by the layout Pelly showed me, and if I saw a house type I didn’t like, I turned it off. If the house types were promising, I time-travelled ahead to see what the other house types were. In another town I was tempted by, I found my favorite neighbor, Melba! Her reaction was adorable. I liked this layout Pelly showed me despite the diagonal bridges and lack of holding ponds (the only pond is by the gate, which is kind of an odd place to have one). Still, I thought the gently curving river and the tiny island were nice, so I decided to check out the houses of my first three neighbors: Vesta, Rod, and Puddles. I was pleased to see both these house styles because they’re two of the colorful/whimsical styles I wanted for this town. But every town has four house styles, so before picking this as my town, I had to see what the other two styles were by time traveling. A new house style revealed! So far so good, this is another one of the matching colorful styles I like. And the final house style is revealed with the eighth neighbor to arrive in Dafdilly (and making my town full for the first time), Patty! I’m glad it was this green and yellow checkered house style because it goes well with the other checkered house styles I have, and my square grass. But I would have also been happy with this house style. I’m also super happy that I didn’t have to time travel further to figure out what all four house styles were, ’cause that very well could have happened if I was less lucky. Since I decided to keep this town, I time-travelled back to the correct date and started to do Nook’s chores. Of course, the first thing he has you do is plant flowers around his shop. Then he wanted me to meet the rest of the residents in Dafdilly. I have a lot more to meet than the usual three, since I time-travelled to figure out what all the house exteriors were. The first neighbor I came across is Puddles! Yay, I love her! 🙂 I’m going to try to keep her long-term. She has a lovely carpet/wallpaper combination, the daisy meadow and lunar horizon. I’ve had Amelia in a previous town, and I have her picture — I try to collect them. Vesta is really cute! She has a sewing machine and lots of shirts and sweaters in her house, so it seems like making clothes is a hobby of hers. And it kind of makes sense considering she’s a sheep and their wool is sometimes used for clothes. Aww, it’s Joey. There are only a few villagers that I remember vividly from my first AC:GC town: Aziz (I remember talking to him constantly for a long time one night because he kept giving me presents), Tangy (I was jealous of her fruit furniture), Olivia (because she’s the first Animal Crossing villager I ever met), and Joey. I’m not sure why I remember Joey. I remember he had a backyard pool, sprinklers, and a red boom box in his house, but they seem to have changed it in Wild World. Patty, who I wouldn’t have guessed was a peppy by looking at her. Peewee. I don’t really like the grumpy apes, they seem more aggressive than other crankies (like when they yell and get angry). Plus, I already have his picture from a previous town, so I will let him move when the time comes. I guess Rod’s pretty cool, he has a unique appearance that matches his pirate-themed house. Blaire’s got a lovely secluded beach house all to herself, a wonderful house location. I like her well enough, but I probably won’t hold onto her long because there are better snooties in my opinion. She has a nice citrus room, though! But who cares, I’m free! 😀 The game begins here, really. The final thing I did that night was arrange some common flowers in ways that can produce hybrids. No luck so far, but it’s only been one day. Then Puddles ran up and gave me a nickname. It’s not bad (to me, anyway) — better than some of the [insert word here]-T nicknames. It was Blaire’s birthday! Fun to have a birthday to celebrate so soon in my new town! ^^ Joey was there too. I gave Blaire a lime chair even though she already has one. 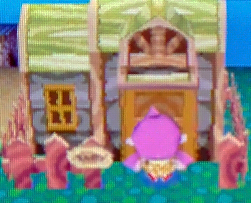 The only tools available at good ol’ Nook’s Cranny were the fishing rod and the net, so I used them to get a good start on my museum and to pay off my first mortgage. First bug caught in Dafdilly. First fish caught in Dafdilly — not a sea bass! I also caught a few rarities, like this banded dragonfly! Good to catch it now before I add more flowers around town. Also caught a blue marlin, not bad for the first day! After all that hard work fishing and bug catching, I take a rest in The Roost and have my first cup of coffee with Brewster. While I was fishing I noticed this pretty rainbow forming in the sky. I’m not sure why; I thought they only appeared after rainstorms. I used the bells from my catches to pay off my first loan, which is a piece of cake in the summertime. I get so excited about having a new town and wanting to make progress on my catalog, that I end up triggering the shop expansion too quickly, I think! I would’ve been happy to enjoy the quaint Nook Cranny atmosphere a bit longer. But progress is still good, I suppose! Posted on July 3, 2011 by Amy •	This entry was posted in AC:WW, Dafdilly and tagged Animal Crossing. Bookmark the permalink.